IT CAN BE ARGUED that Portuguese, Dutch, and French merchants exploited India; Britain remade the subcontinent. British East India grew from a series of coastal trading posts to encompass the part of the Indian subcontinent taken by the current states of INDIA, BANGLADESH, and PAKISTAN. The subcontinent’s southern peninsula extends to the HIMALAYAS mountains that separate the subcontinent culturally and geographically from the colder CHINA and MONGOLIA and Asia proper. Bangladesh, India, and Pakistan cover 1.5 million square mi (3,885,820 square km ) of land. The climate ranges from tropical monsoon in the south to temperate in the north. Geographical features include the Deccan Plateau, the Baluchistan Plateau, the INDUS and GANGES Plains, as well as mountains and deserts. The Governor and Company of Merchants of London Trading into the East Indies received its charter from Queen Elizabeth on December 31, 1600. The first East India Company ship reached Surat in 1608, where the company established a factory in 1615. Along India’s east and west coasts, English communities were settled in Madras (1639), Bombay (1668) and Calcutta (1698.) The company used alliances and treaties with hundreds of local princes to control more of India while also exploiting the East Indies. Mostly, it left the people to themselves, except when it exploited or mismanaged laborers. In 1717, the company won exemption from customs duties in Bengal. In 1748, the British defeated the French, removing their last European rival. At the Battle of Plassey (1757), Robert Clive bested the nawab of Bengal and became ruler of India instead of its trading partner. The company mismanaged Bengal, alienating the people. Military expenses became almost overwhelming, so the British government implemented Lord North’s India Bill, the Regulating Act of 1773, which established a British governor-general, the first of whom was Warren Hastings. The company continued to collect revenues, negotiate agreements, and expand its territory. The British took territory they considered poorly ruled. Sometimes a remaining native ruler had a British adviser. Under the practice of lapse, British India acquired all states with no successor on the death of their rulers. British India absorbed Sambalpur (1849), Baghat (1850), Jhansi (1853), Nagpur (1854), and Awadh (1856). Annexation, taxation, and desperation provoked the Sepoy Mutiny of 1857–58. The wars ended company rule as the British occupied the 750,000 square mi (1,942,481 square km) inherited from the East India Company. By 1900, 100,000 British ruled 250 million Indians. Under the Raj (1858–1954), Queen Victoria promised to work for the welfare of the native people. The doctrine of lapse ended. The British recognized the princely states, roughly 562 of them with 40 percent of the territory and 20 to 25 percent of the population. In practice, outside British India, the states could not escape British political, cultural, and economic influence. India received the English educational system, an expansion of its coal and iron mining, and plantations for tea, coffee, and cotton. Metal-plated roads and a hundreds of miles of railway linked the major cities and the coast. Telegraph lines stretched 4,000 miles. Agricultural and social reform occurred as well. Indians became increasingly Anglicized. They joined the civil service and published English-language as well as vernacular journals. Indians also became nationalistic in the 19th century. To ease conflicting Muslim and Hindu nationalisms in the late 19th century, the British wanted to partition Bengal into Muslim east and Hindu west. British East India expanded by absorption of its neighbors. Border disputes with Burma in 1824, 1852, and 1885 resulted in Britain’s taking of upper Burma into the Raj as India beyond the Ganges. Burma became a Crown Colony in 1937 and independent in 1948. Punjab was a region of interest from the 1830s and eventually became part of India. Indian Ghurkas ruling Nepal fought a war with northwest India (1814–16). They conceded territory and Ghurka troops fought in the British and Indian armies. Bhutan and the East India Company had a treaty of cooperation from 1774. After a war in 1864, Britain had oversight of Bhutan’s external affairs. The role was taken first by British India (1910) then by independent India (1947). Bhutan became independent in 1949. Overseas service under Great Britain command in World War I increased pressure for more Indian participation, with the Indians always a step ahead of what Britain would grant. Finally, after World War II, British India ended, replaced by independent India and Pakistan in 1947. The transition was violent, with perhaps 500,000 dead, and a migration of 11 million Hindus, Sikhs, and Muslims. And states such as Hyderabad that wanted independence had to choose either India or Pakistan. Hyderabad chose India, as did KASHMIR despite being predominantly Muslim. Britain gave India its university system and its middle class and elite cultural artifacts such as clubs and gyms. Britain standardized grammar, gave away dictionaries, and provided the printing press, the Kalighat school of painting of the 19th century, and cricket as well as scotch and soda. For the dams, roads, sanitation, and other infrastructure Britain gave India, in return it imposed laws requiring India to produce plantation crops. British restrictions on Indian manufactures kept the economy dependent. The shift from agriculture for internal consumption increased Indian risks of famine and death. By the 1880s, India took as much as 20 percent of British imports. 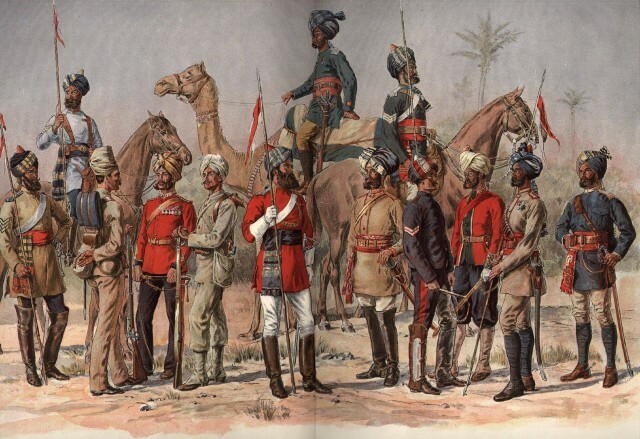 By 1900, India paid Britain £10 million per year in interest and also paid salaries and pensions for the colonial administrators. India paid well for British improvements.